In the previous Pinball post, I wrote about getting the OLED going and getting the footprint onto my printed circuit board. Now I need to make PSoC firmware to drive the display. 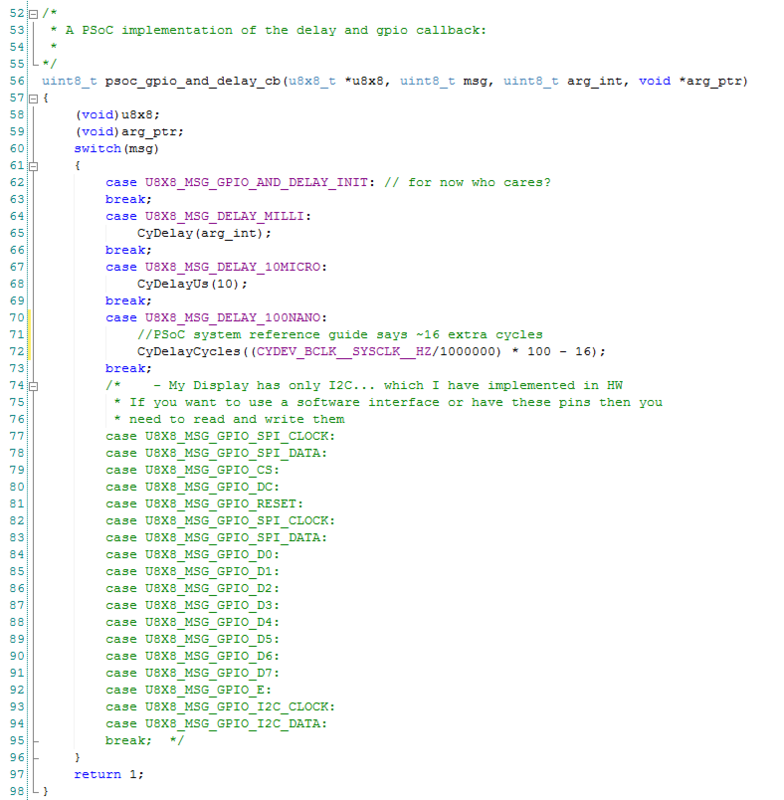 I turns out that there are a number of different driver chips out there including at least SSD1306, SH1106, LD7032, SSD1325, and ST7920 that handle multiplexing the columns/rows, managing frame buffers, power management, etc. To make matters more fun, these chips support I2C, 3&4 wire SPI and a couple of different parallel interfaces (6800, 8080). I certainly didn’t want to go down the rathole of building up a complete driver library. But I didn’t have to, as it turns out that that Oliver Kraus built and open-sourced a very nice library that you can get at www.github.com/olikraus/u8g2. This library (and its predecessor u8glib) seem to be in pretty wide use in Arduino and Raspberry Pi. 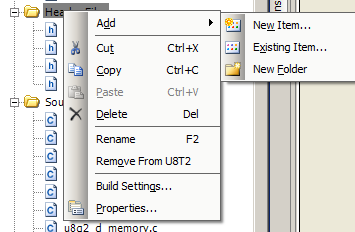 Change the build settings (right click on the project and select building settings) then add the directory in “Additional Include Directories” and include the “u8g2/csrc” directory. Build a schematic which has an I2C (for the display) and a debugging UART. The I2C is configured as a master with 400kbs data rate. 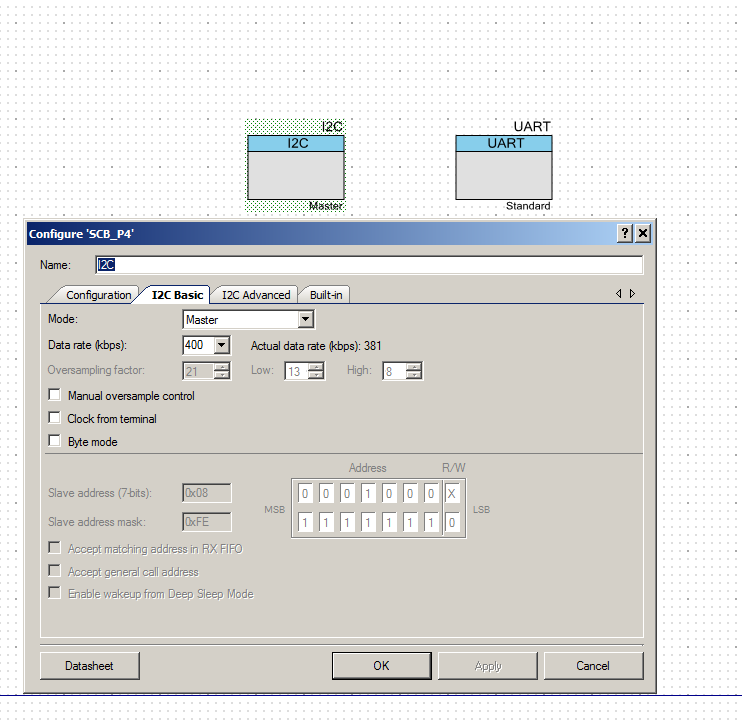 The UART uses the default configuration. The GPIO and Delay interface is used by the byte oriented communication functions to read/write the GPIOs and provide delays. 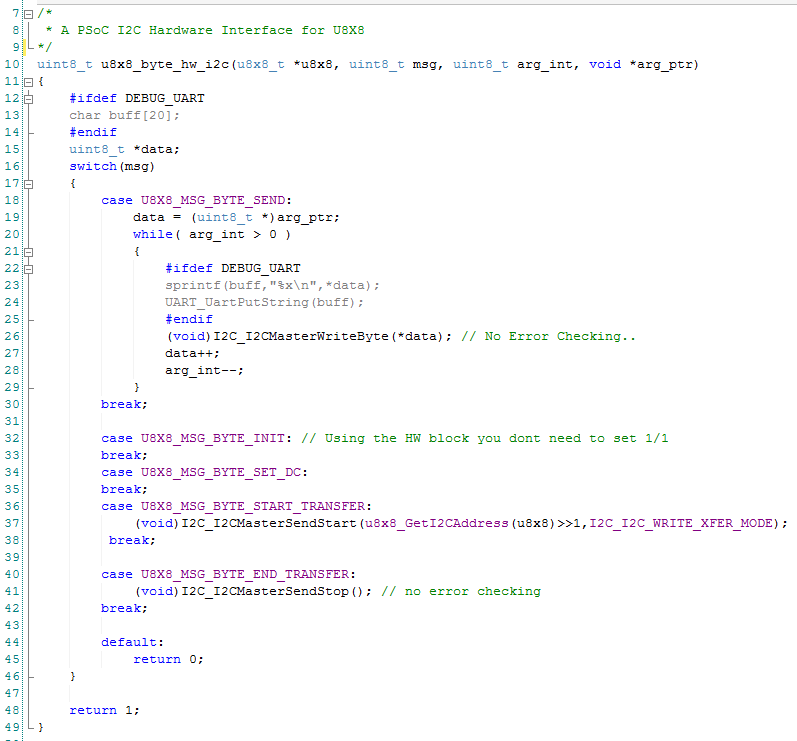 This function provides the underpinnings of a bit-banged I2C, UART, SPI etc. 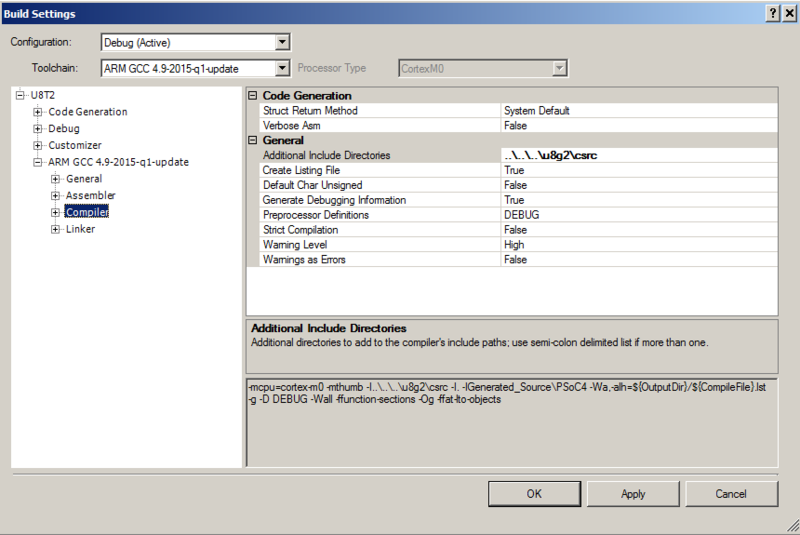 Because I am only going to use PSoC Hardware to provide the I2C interface I will only respond to the delay messages. All of the delay functions are implemented as busy wait loops, which I am not a big fan of. The input to the function is a “message” that is one of a sprawling list of #defines in the file u8x8.h. I believe that I found all of the possible cases, but I am not sure. The first message, UX8X8_MSG_GPIO_AND_DELAY_INIT doesnt need to do anything because the GPIOs are configured correctly by the default. I did not respond to the messages of the form U8X8_MSG_GPIO_X which are the read and write of the GPIOs as I am not going to use the bit-banged interface. The other function that needs to be provided is the byte-oriented communication function. This function needs to respond to the messages to start, send, and end communication. I just mapped those messages onto the PSoC hardware APIs. While I was trying to understand what was happening with the system I implemented a debugging UART which you can see in the #ifdef DEBUG_UART sections. You can find all of the source code and files at the IOTEXPERT site on github. Hi, i cloned your repository and there’s a missing file (u8x8hal.h), couldn’t find it on the u8g2 repository, anyways the project compile successfully :). Yes. I was/am planning on moving the code that makes the hardware access layer work into that file instead of having it in main. But I can’t decide the best way to implement it. As soon as I figure it out Ill do that. Really I want to make it all a component… but Im don’t want to permanently freeze his source code into the component as it continues to change… so I am not sure. Email me (engineer@iotexpert.com) your real address and Ill send you development kit for pointing out my error. Thanks for the kit, just sent you my address :D.
Maybe to keep track of the changes on the u8g2 source code you can add it’s repo as a git submodule on the custom component repository. The real problem is that there is a flaw in the design of the HAL… I have itchy fingers to fix it… but don’t really have time… that is what kept me from really dealing with the problem. I have been wondering if this is still the best starting point to interface PSOC 4 to SPI e-ink display in your opinion? If that EINK display driver is in the library… then yes I think that is best. But I dont know which one you are talking about. I was trying to use your example of driving a OLEd dispaly from IOTexpert. I have a 042 kit and am having trouble compling you example code. My erroe tells me that it is unable to load …. Unable to find the file on disk: “C:\Cypress Files\U8G2\u8g2\csrc\u8g2_bitmap.c”. What am i missing, i have setup the build settings as you instructed. I suspect that you have not added all of the .c files to your project.